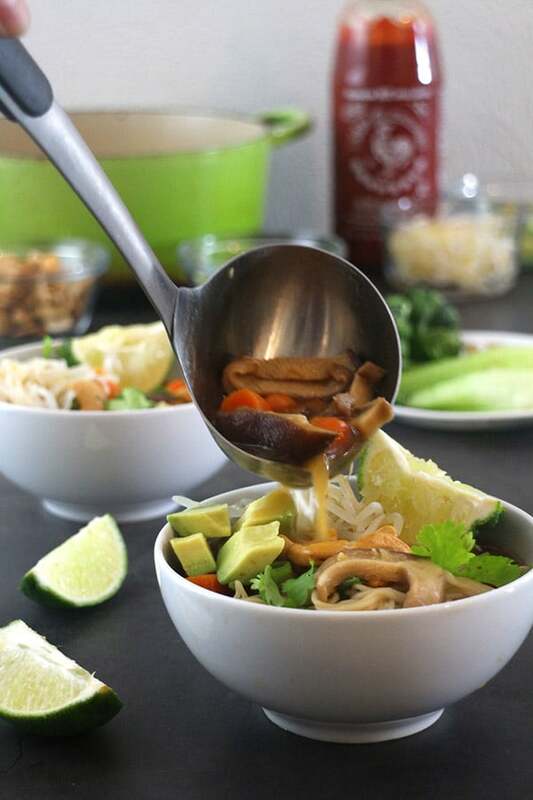 This cozy bowl of Vegan Ramen Noodle Soup is ready in about 30 minutes. It’s packed with flavor and the perfect supper for a busy evening or when you’re feeling under the weather. 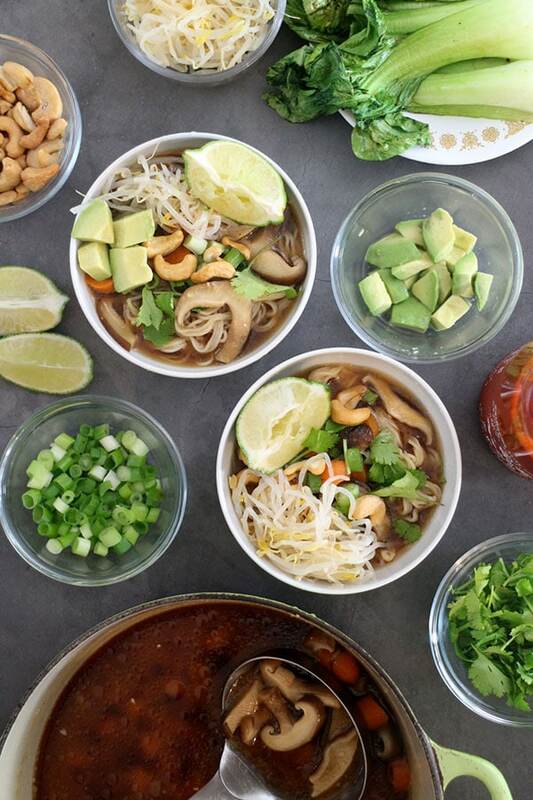 The trick to this super quick vegan ramen is all about the cheats. 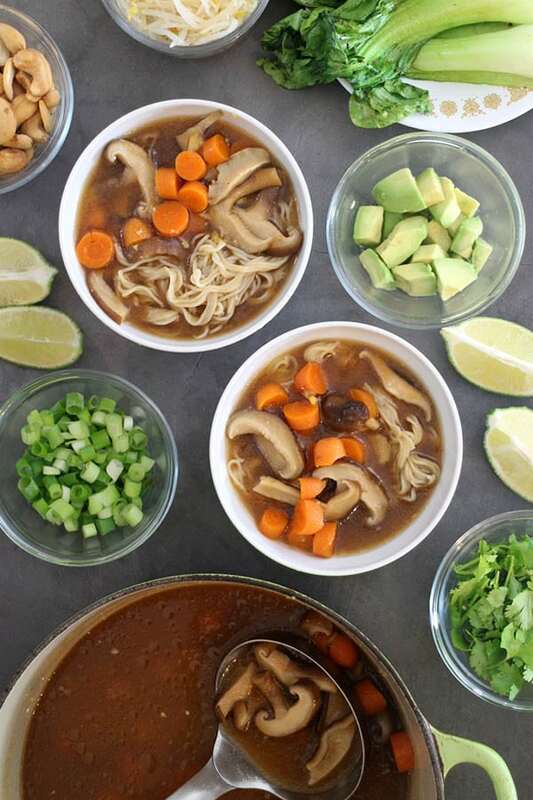 Instead of making from-scratch ramen broth (which is delicious but time-consuming), you use a mix of flavorful pre-made no-chicken broth and miso broth. Add some quick-cooking ramen noodles, and you are ready to top and eat! I try not to lean too hard on brand name ingredients in my recipes, but you’ll notice a couple of brands in the recipe below. None of them are sponsoring this post, though I am using Amazon affiliate links (which cost you nothing but give me a little kickback that helps me keep the lights on around here). The brands listed in the ingredients are the ones I used to develop this recipe. You are welcome to substitute other brands, but I can’t guarantee that you’ll end up with the rich, flavorful Vegan Ramen Noodle Soup we’re going for here. Making this soup in the time allotted is all about strategy. My Nani Dorothy taught me to never be idle in the kitchen. You can always be getting some cleanup done or prepping the next ingredient. For this recipe, we’re focusing on the latter to keep cooking time as short as possible. Prep as much as possible while the noodles are cooking – work in order, so if you aren’t totally done, you’ll have those initial ingredients ready to roll. Prep any remaining ingredients while the broth simmers. Bonus points if you’re able to clean up as you go, too! If you try to prep everything ahead of time, you’ll add about 10 minutes to the total time, which is still pretty darn good for vegan ramen. But we’re going for speed here. 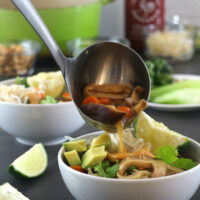 As you can see, there are lots of optional toppings that you can pile into your bowl of vegan ramen. I tend to be a kitchen sink gal when it comes to pretty much any topping situation, but don’t feel like you have to use everything listed just because I do. Choose your favorite toppings, and serve them on the side. One of the joys of ramen is that everyone gets to choose their own mix-ins! Cook the noodles according to package directions. Drain, rinse, and divide between your bowls. 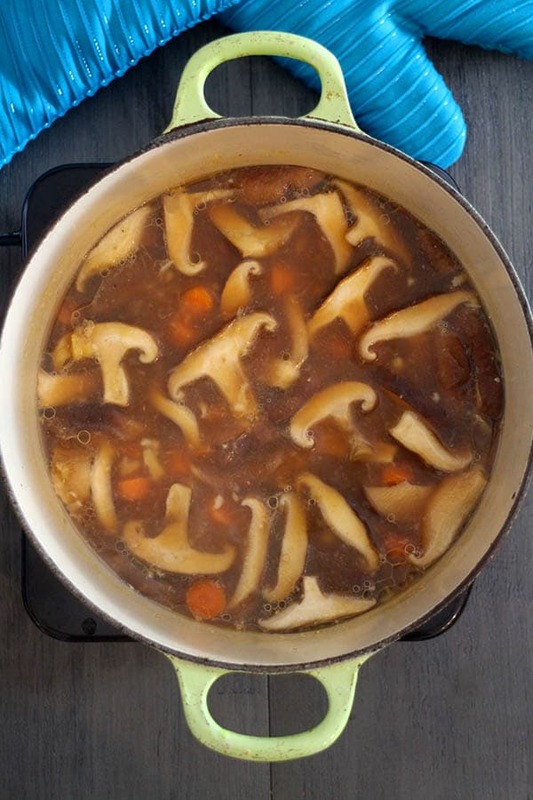 In a soup pot or Dutch oven, combine the garlic, ginger, water, miso paste, broth cubes, carrots, and mushrooms. Simmer, stirring occasionally, until the miso and broth cubes are totally dissolved and the carrots soften, about 6-8 minutes. 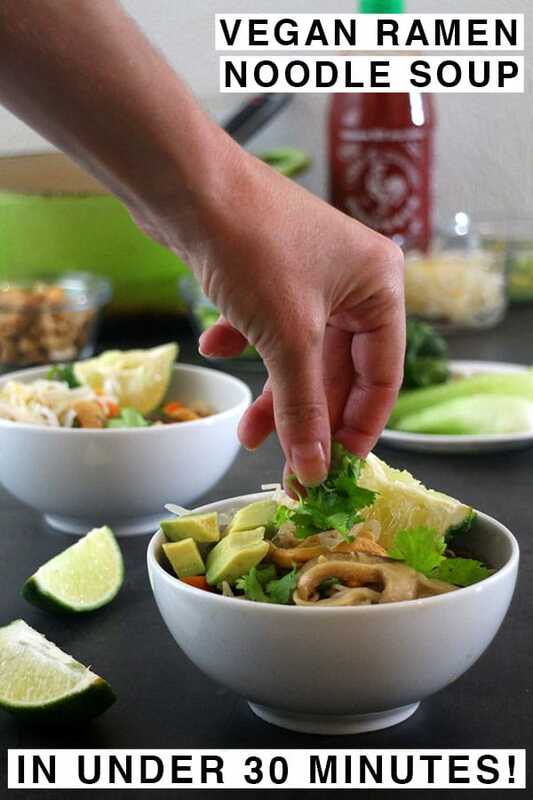 Ladle the broth and veggies over the noodles, then serve with the toppings of your choice on the side, so everyone can build their own bowls! The trick to making this recipe in 30 minutes is timing. Prep as much as possible while you cook the noodles, and do any remaining prep work while other things simmer. Calorie information is calculated for the soup only. Toppings will add to the total calories. Thank you, Joe! I appreciate the love. Oh, we love ramen! We’ll give your version a try. All about easy weeknight meals with the boys’ busy schedules!!! Me too! Easy, cozy meals are the best! I haven’t tried the Not Chicken broth cubes. Lately, I’ve been into Better Than Bouillon. I’ll have to give them a whirl! Oh, my gosh, this ramen is seriously calling to me. It’s been so cold lately, I need allllll of the cozy foods. Avocado in ramen? 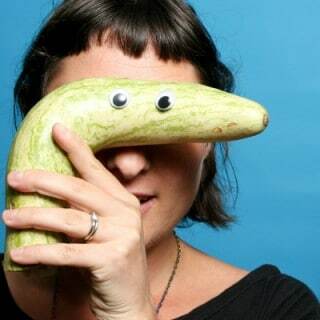 You’re doing the good work here! Better Than Bouillon would totally work in this recipe, too! I get the cubes because that’s what Kroger stocks. They have a not beef variety that is harder to find around here but so good! I love Nani Dorothy’s advice of never being idle in the kitchen. This is so perfect for busy weeknights and lazy Sunday afternoons. Right? It really stuck with me, and I love having as few dishes as possible to deal with after mealtime.